More and more Vermont farmers are using creative ways to acquire capital for land acquisition, start-up and operation. At the same time, increasing numbers of individuals are exploring alternative investment vehicles and ways to help finance small businesses within communities. The Guide to Financing the Community Supported Farm details options and considerations for crafting unconventional financial arrangements that have been used in other sectors of the economy, but might be new to the agricultural sector. The 62-page guide addresses legal, accounting, environmental and social considerations relevant to pursuing customized financial agreements, and contains examples of farms who have used alternative financing. Available for free download in its entirety or by individual chapters. 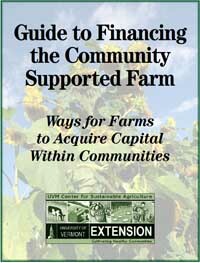 Click here to download Guide to Financing the Community Supported Farm in its entirety. Or, download chapter by chapter below. Farm Case Studies: Bloomfield Farm, Highlighting Cohousing and Cooperative Land Ownership; Fair Food Farm, Highlighting Creative use of Promissory Notes; Bread and Butter Farm, Highlighting Purchasing the Farm and Community Financial Support; Sugar Mountain Farm, Highlighting Bootstrapping, Vendor Financing, Pre-buys and the Quest to Build On-Farm Slaughter Infrastructure. The Guide was produced by the UVM Center for Sustainable Agriculture with funding from Northeast SARE.